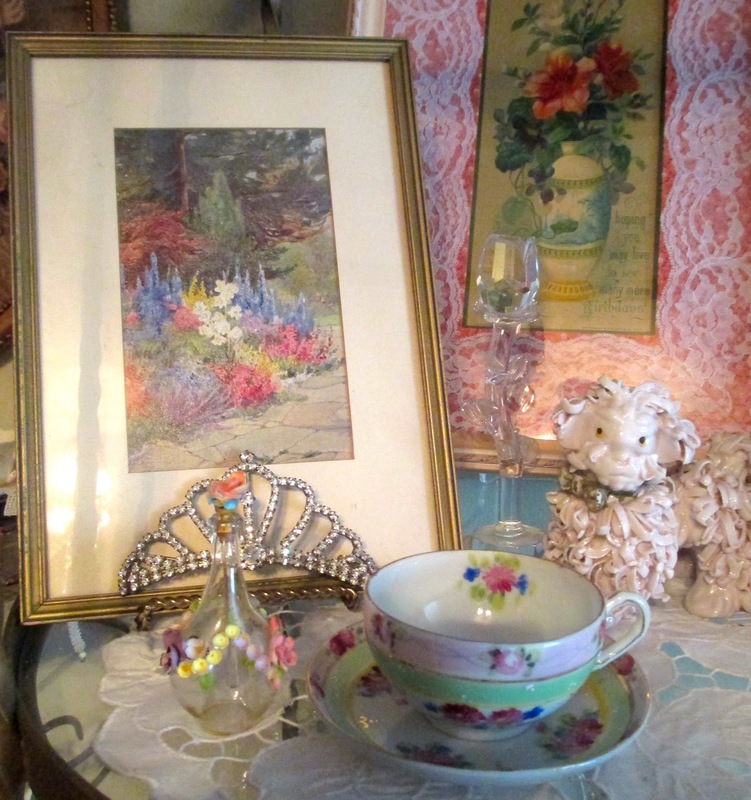 Martha's Favorites: TEA CUPS, POODLES AND FIRSTS' FOR ALL! TEA CUPS, POODLES AND FIRSTS' FOR ALL! Hello Ladies! Welcome to Tea Cup Tuesday No. 179! I am so sorry about the different linky, however, I thought it would be better than no linky at all. We had a lot of new ladies join us last week. That was great because, many of our regular party ladies are taking the month of August off. I want to welcome everyone who joined us for the first time last week. Nothing brings ladies together more than a fancy tea cup and some wonderful tea shared with a new found friend. I love to visit each of you and can't wait to see what you are sharing today! Can you believe August is almost gone? We need to start thinking Autumn. In California there are lots of fires and it seems everywhere else, there are floods. I am trying to stay away from too much news because it just makes me nervous and I need to trust God. My home is only 3 blocks away from the foot of mountains that have not burned in years. One of those three blocks includes a large park. I just have to pray that God has mercy on this country of ours. I have begun to change my house over to blacks, whites, yellows and orange for the next month. It is done slowly but it is done each month. I have my kitchen almost done. This first tea cup that I am sharing is a New England Toile design. It is a new cup and as you can see I have several pieces. The little tag inside the cup is made by Terri. If Terri or anyone for that matter makes me something, I use it all year. It reminds me to pray for them and just how precious my friends are. Terri, is a keeper! My next cup is a Royal Standard. It has a wonderful corset shape cup. Have I ever told you I collect poodles? Well, you guessed it I do. I don't know why I have failed to show you before, but you will find a few of them in this post. I have them in all colors. They remind me of my Grandmother. She loved them and I think that is way I collect them. They bring a smile to my face because of my Grandma. Anyway, that is my excuse and I am sticking to it! This last cup is a Clarence from England. I love how it looks like someone just picked it up and the sides stayed ruffled. Too cute. This last few days have been a week of first's! 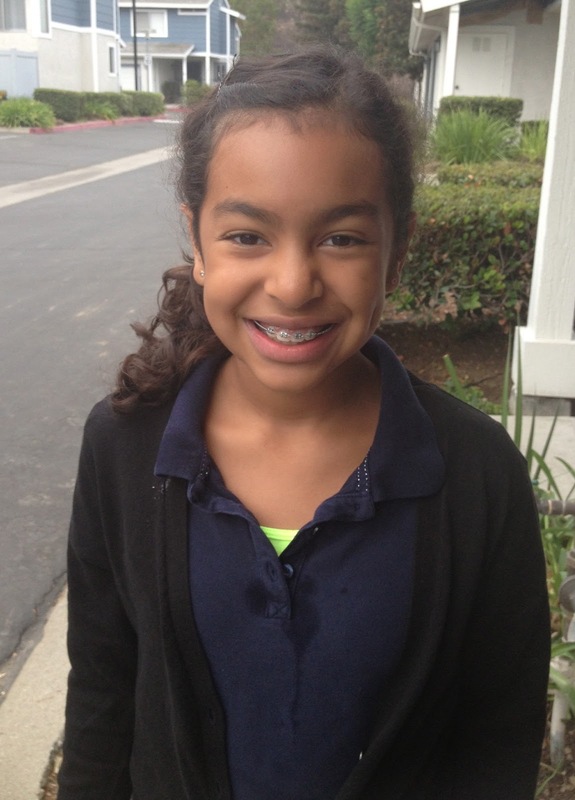 Maya had her first day of school, Noah his first day of Kindergarten and Sophia had her first sleep-over with Grandma. (Notice the black clouds under Noah's rainbow, may he was not so sure?) I pray that all our children will be safe and learn all they can this school year! Oh I absolutely adore your black and white china - esp the toile, that is so unique! I had a neat couple of black teacups that I sold a long time ago, wish I hadn't now - your collection is inspiring! I am so glad the children enjoyed their firsts - and I am sure those black clouds are just because white didn't show up and they didn't have silver or grey to use! No worries. I love your faith and prayer, it is inspiriting to remember to give up our concerns to the feet of Jesus. I am sharing a post I did a few days ago- had (kinda still do) intentions to do a Anne of Green Gables tea but didn't feel very well the last couple days and my energy is zapped. Tomorrow have a contractor coming at 9am - so perhaps if I feel better and he is gone quick enough I can muster up my idea - but if not sure didn't want to miss your linky. God bless, big hugs to you and yours, sweet lady. What cute photos of your family. I absolutely LOVE your black and white toile pieces! Swoon, swoon! I like the corset shape cups too. I find they are very lady-like and elegant. Thanks for sharing and enjoy your week. Hello Martha, you have the most amazing collection of teacups - LOVE the black and white - I have been praying for those facing fires, floods and severe weather - this surely has been an unusual year. Oh sweet Martha your black and White china is gorgeous! Very unique and at the same token, very femenine too! You have a beautiful family and those children are a treasure, sweet lady! Thanks for the lovely party. Have a nice week. Thanks so much for hosting, Martha. I love your Happiness sign. I think we could all use some of that encouragement. Beautiful tea cups. Your post today really touched me! 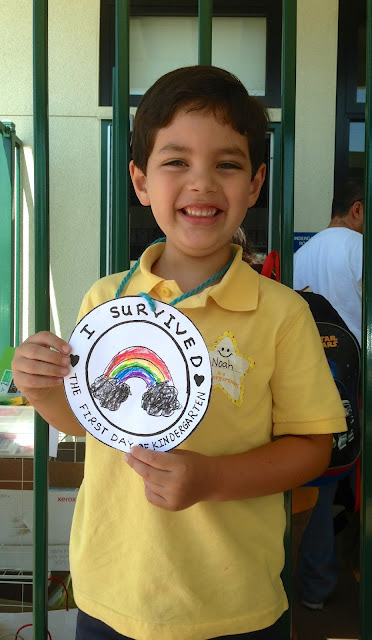 I could so relate to your darling grandson's artwork "I made it through the first day of kindergarten". He is just adorable and this is the time of year where I am usually so focussed on September's Back to School events. I just love his teacher's idea. 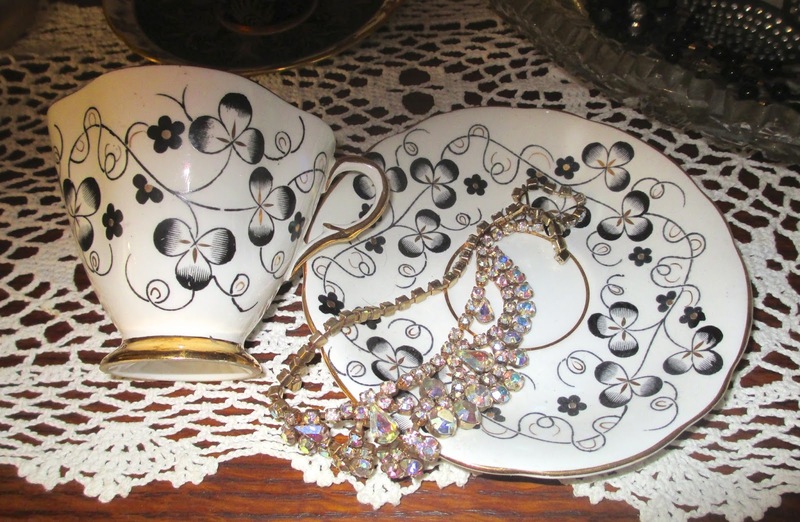 Your black and white teacups are so very beautiful! Just gorgeous! Thanks for visiting me. your joy in your home is contagious, I love that you change things up, the color scape you chose is so beautiful! Its so nice to meet you, such beautiful tea cups, and lovely Grand children! I love the black and white toile china and the poodles!!! Sweet photos of your grand children! I am not astonihed that you collect poodles, too. But whatever you collect, its allways nice and makes happy to see. Your tea cups are so outstanding as your other collectibles. And your sweet grandskids! Whow, how time is running! Thank you for sharing the treasures of your life and for hosting this sweet event. I love your black and white toile, I have changed my bedroom to this style. What a great idea the I survived medallion is. Hope the dark cloud was just what was out the window! Always fun to see what everyone has come up with. I feel like a pigeon among peacocks but it's such delightful company. The black and white teacups are beautiful as are the poodles. When I saw that tag, I thought "looks like Terri made that". I was right! It is so pretty, and that is so caring of you to remember everyone by keeping their gifts on display. Have a wonderful week, Martha! Beautiful post, Martha, beautiful dishes, and thoughtful words. Will pray that God keeps you safe during the wildfire season. Hello Dear Martha....Loved seeing the kids. They are getting so big! Unbelievable. Loved all your cups as well as the sweet little figurine. 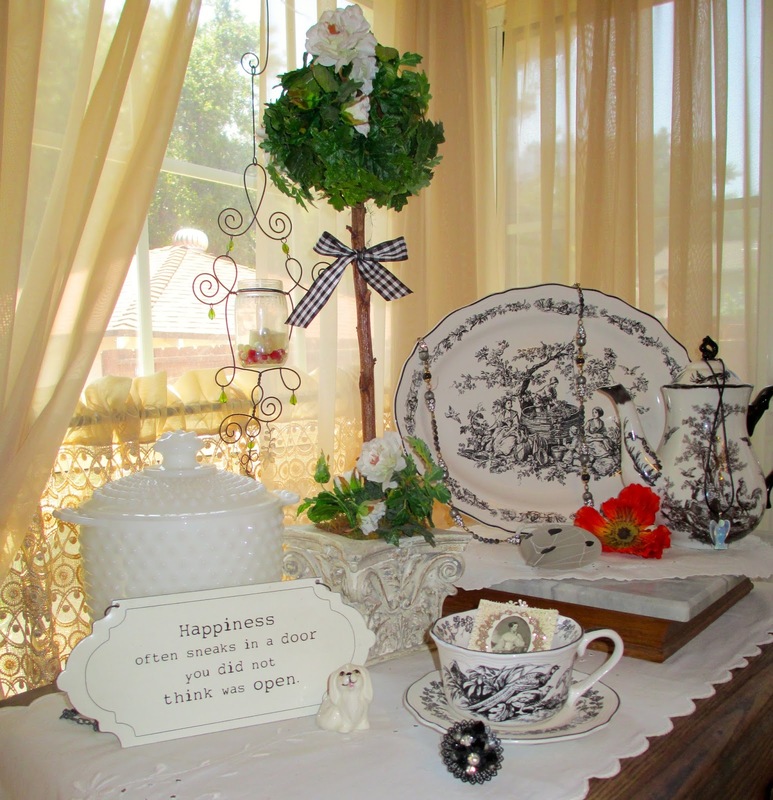 Oh I love the black toile tea set ! I hope you're all safe from the fires. That seems so scary Martha. Your grandchildren are growing up so quickly. A lot of "firsts ' for you all, but what wonderful "firsts" ! 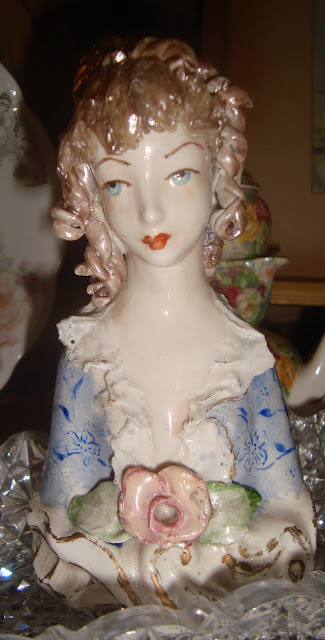 I'm enjoying seeing all of your vintage treasures and beautiful china! The black and white is classic. And you have a beautiful family, too! I can't wait to look around your blog more! Sweet hugs! Hi Martha, what a treasure you have there. I haven't seen many black & white tea cups, yours are pretty. And I love the little poodle. Do you sell your tea cups? TEA CUPS, PARTIES AND THINKING TOO MUCH! TEA CUPS, LADIES & PERFECT GRANDCHILDREN! TEA CUPS AND THE MOTHER LODE OF ESTATE SALES!